There is no statue of Emmy Noether. Yes, she’s had a Google doodle. 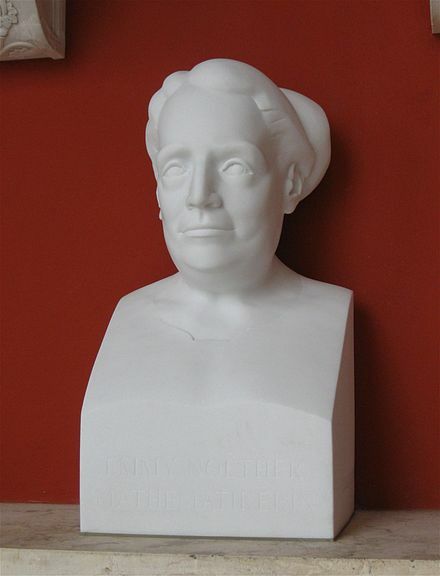 Yes, there is a bust of her in the Hall of Fame in Munich. But no statue. To those who don’t know, Noether was one of the most influential of twentieth century mathematicians. She accomplished ground-breaking work in abstract algebra, and had a major impact on physics in her work on symmetry, conservation laws and relativity. She did all this in an academic environment that was extremely hostile to female mathematicians, where she had to audit courses at the University of Erlangen since they didn’t accept women students. Perhaps mathematicians don’t typically get their own statues. Wrong! 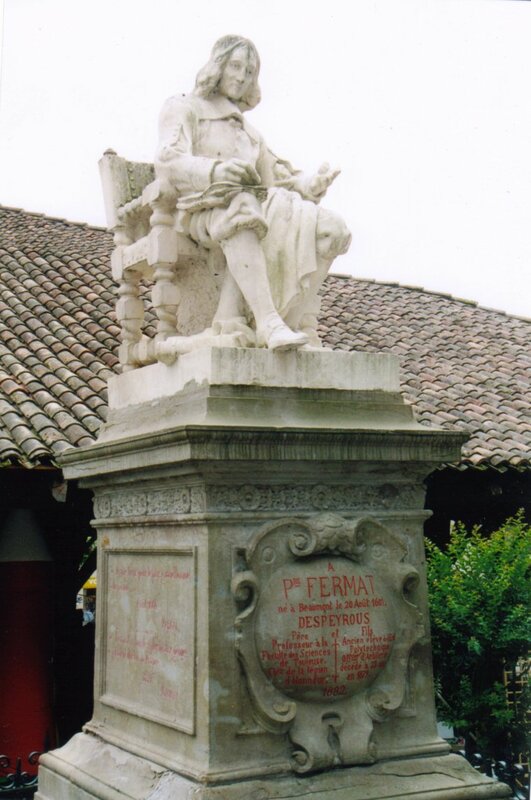 Here is a statue of Pierre de Fermat in Beaumont de Lomagne in France. 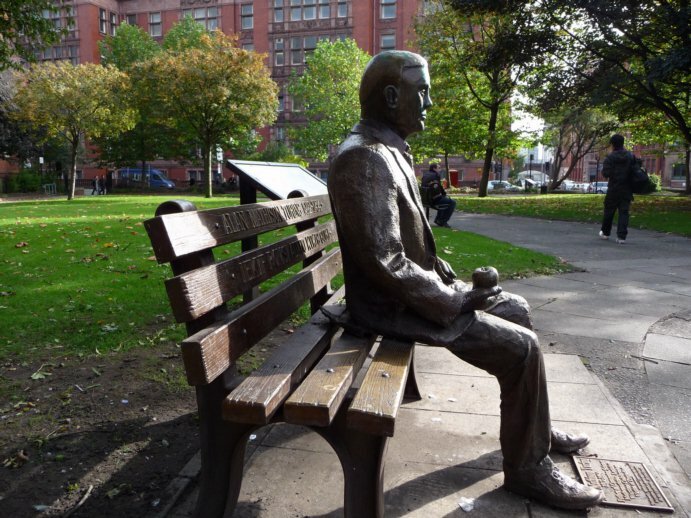 Below is a statue of Alan Turing in Manchester, England. Here is one of Srinivasa Ramanujan in Chennai, India. And there are many, many other examples. Monuments on Mathematicians is a site listing statues, busts, stamps, and wells dedicated to mathematicians. 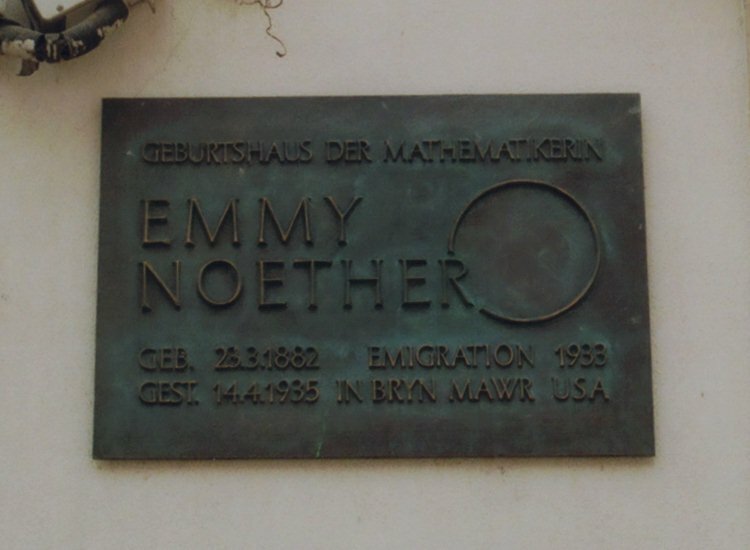 Noether has a plaque in her honor in her hometown of Erlangen, Germany. 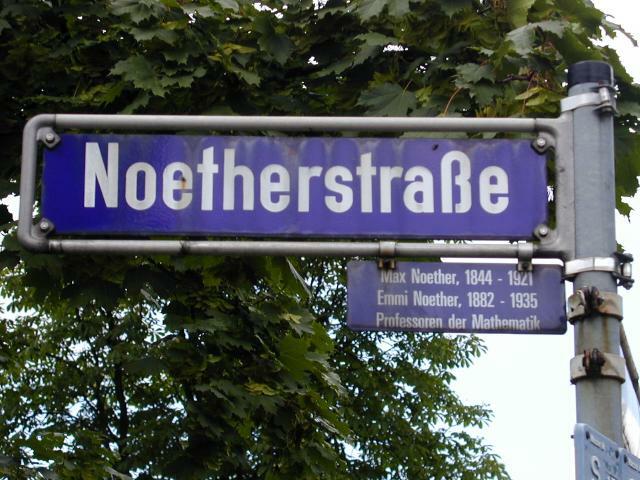 There is a street in Erlangen named after her and her father Max Noether, who was also a mathematician (listed first on the sign, although she was more epic). A recent public lecture event Celebrating Emmy Noether, with speakers such as Ingrid Debauchies and Georgia Benkhart, took place at the Institute for Advanced Studies at Princeton. 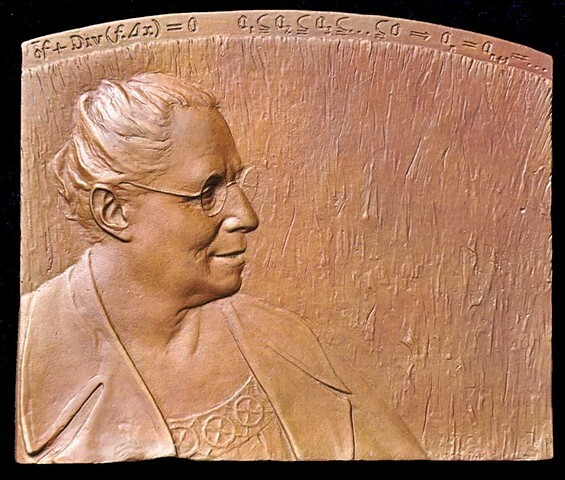 As part of the event, a bronze plaquette was unveiled dedicated to Noether. Plaquette of Emmy Noether by artist Stephanie Magdziak. Emmy Noether deserves recognition not only in the form of plaques and street names, but in a statue along with the other greats of my field. I would like to see it a Bryn Mawr, her adopted home after fleeing Nazi Germany. 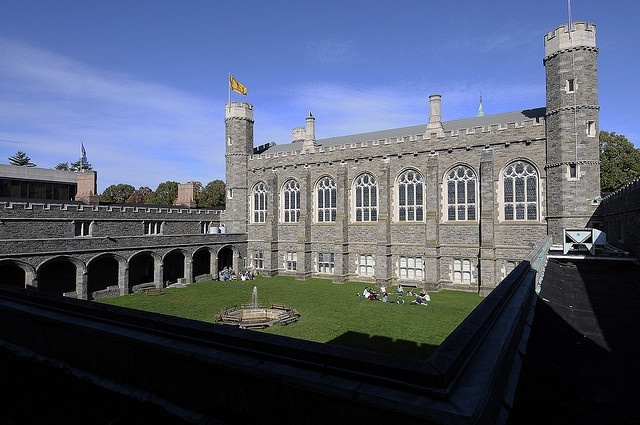 Bryn Mawr is women’s liberal arts college four miles outside Philadelphia. American gave her a safe place to conduct research and teach, and it was there she met her untimely death after complications from surgery to remove uterine cancer at the age of 53. Given Noether’s stature, her lasting impact in mathematics and physics, and incredible life story, a permanent statue at Bryn Mawr would be absolutely appropriate. It would be fantastic! The Cloisters at Bryn Mawr. The Cloisters is a quiet courtyard at Bryn Mawr, with a small fountain surrounded by grass. There are outdoor theater performances there. Emmy is buried in The Cloisters, and her simple grave marker—marked with only her initials E.N.—is embedded in the pavement. Emmy Noether’s grave marker at The Cloisters. A statue honoring the greatest mathematicians of the twentieth or any century would be a fitting addition to this solemn place. Emmy’s memory deserves this. I just noticed your blog, after discovering Emmy Noether only yesterday. I was impressed by her life story and accomplishments but also amazed that she remains so obscure. I will be visiting Erlangen soon, so I was checking to see if there was a statue of her. I will definitely check out the plaque there, but I agree there should be a statue of her in either Erlangen, Göttingen (although they may not deserve it after chasing her away in Nazi times) or Bryn Mawr. Thanks for this. I think her statue would be best at Bryn Mawr. It is long overdue.